Harrisburg, PA – Today, Governor Tom Wolf announced the approval of 27 rail freight improvement projects that will help sustain more than 400 jobs across Pennsylvania. 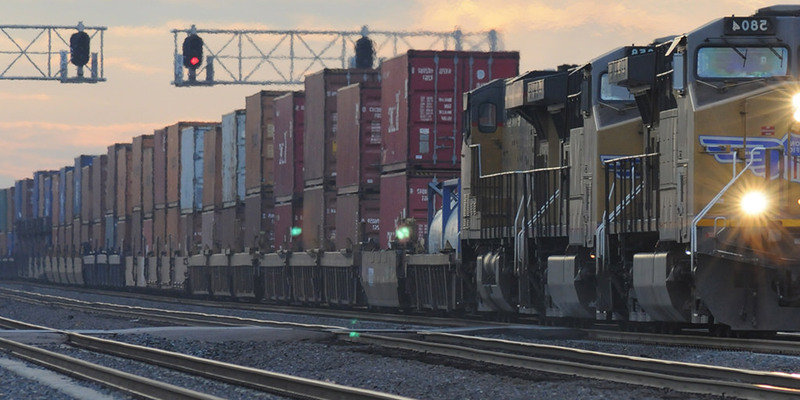 The State Transportation Commission voted to approve $32 million for the projects through the Rail Transportation Assistance Program (RTAP) and the Rail Freight Assistance Program (RFAP). Pennsylvania, with 67 operating railroads, has more than any other state and PennDOT’s focus is on working with private rail operators to assist in maintaining and improving the roughly 5,600 miles of freight lines in the state. Allegheny Valley Railroad Co., rehabilitate nearly 10 miles of the P&W subdivision from Bakerstown to Glenwood Yard, including replacing continuous welded rail and surfacing track to maintain safe rail operations, $2.9 million. The Techs Industries, rehabilitate about three miles of track including tie replacement and track surfacing at the MetalTech and GalvTech facilities in Pittsburgh to maintain safe rail operations, $328,277. Tube City IMS, LLC, rehabilitate about one mile of track in the West Mifflin plant yard as part of a 4 phased project, including replacing turnouts and ties, track surfacing, and track realignment to increase efficiency of yard operations, $700,000. W J Beitler Co., construct a rail siding from Pittsburgh and Ohio Central Railroad to W J Beitler’s facility, which will provide new freight rail service, $250,000. Wheeling & Lake Erie Railway Company, rehabilitate 18 railroad bridges on Wheeling & Lake Erie Railway Company’s Pittsburgh and Rook Subdivisions including structural and bridge deck, $2.3 million. Shell Chemical Appalachia LLC, construct 10 miles of track from Aliquippa to Monaca, PA to transport construction materials for Shell’s plant and outbound product from the completed plant, which will improve the efficiency of operations and safety, $3.8 million. East Penn RR LLC, rehabilitate 12 miles of track on the Lancaster Northern line and 11 miles of track on the Quakertown line, including ties and track surfacing to maintain safe operations, $630,000. Tyburn RR LLC, rehabilitate about one mile of track at Tyburn Railroad’s Morrisville, truck transfer facility, including the replacement of 800 ties and track surfacing to maintain a state of good repair, $92,400. Gautier Steel, rehabilitate Gautier Steel’s plant tracks including replacing ties and rail, which will improve rail and truck traffic to and from the facility, $239,172. Arcelor Mittal Plate, LLC, replace six turnouts and rehabilitate 450 feet of track at Arcelor Mittal Plate’s West Yard in Coatesville to improve track conditions, $286,944. Mittal Steel USA Railways, Inc., Rehabilitate approximately 700 feet of track and replace 4 turnouts at Arcelor Mittal Plate’s Coatesville plant, including track re-alignment to support the movement of industry standard rail cars, $362,943. RJ Corman RR Company, rehabilitate about 36 miles of track including rail, ties, ballast, and track surfacing on the Clearfield Cluster’s Cherry Tree, Cresson, and Wallaceton subdivisions to improve the efficiency of operations and safety, $4.2 million. Buffalo Pittsburgh Railroad, Inc., rehabilitate about 20 miles of track between Brookville and Falls Creek, facilitating continued freight rail service to Brookville Equipment Corp., $2.1 million. Oil Creek Titusville Lines, Inc., rehabilitate Oil Creek Titusville’s railroad bridge over Church Run including structural and bridge deck, $40,425. Mittal Steel USA Railways Steelton & Highspire, rehabilitate approximately four miles of track, including the replacement of 10 turnouts, five crossings, and track surfacing to facilitate the safe movement of raw materials and finished steel products, $2 million. Norfolk Southern, realign Norfolk Southern’s track in Middletown, which will provide greater clearances for rail freight trains and reduce track curvature, $3.9 million. Western New York PA RR Co. LLC, rehabilitate approximately seven miles of track between Concord and Union City, including the replacement of ties and rail, track surfacing, and repairing an at-grade crossing, which will improve safety, $697,909. Southwest Pennsylvania Railroad Co., replace and surface three miles of track with continuous welded rail from Broadford to the Fayette County line to improve safety and operations, $1.8 million. Scranton Transload Inc., rehabilitate .25 mile of track from Delaware-Lackawanna’s line to Scranton Transload’s facility including the replacement of 2 turnouts and surfacing of track which will allow for materials to be transported to the facility by rail instead of truck, $700,000. The Delaware-Lackawanna Railroad Co., Inc., rehabilitate 19 miles of the Carbondale Line and construct a 1,000-foot yard track, including ties, track surfacing, and bridge repairs which will improve operations and yard capacity, $686,000. RJ Corman RR Co- Allentown, rehabilitate about 1.2 miles of track leading into and within RJ Corman’s Allentown yard, including the replacement of ties and ballast and track surfacing to maintain track condition, $266,673. United States Gypsum, construct approximately 2,000 feet of storage track at the United States Gypsum facility to accommodate longer unit trains and increase unloading efficiency, $250,000. Lehigh Valley Rail Management LLC, rehabilitate about four miles of track, including the replacement of ties, timbers, and turnouts in the River Interchange Yard to improve interchange operations, $350,000. Phoenix Lithographing Corporation, construct approximately one mile of track, two turnouts, and an at-grade crossing in a Philadelphia industrial park to provide new rail se﻿rvice to Phoenix Lithographing Corp., $700,000. Corsa Coal, rehabilitate 10 miles of track from the CSX interchange to the Cambria Branch Plant in Berlin, to improve track condition and safe operations, $345,861. LCT Energy, construct about three miles of track from Norfolk Southern’s interchange to LCT Energy’s Laurel Plant, including an at-grade crossing, which will enable the plant to resume operation, $700,000. Westmoreland County Industrial Development Corp., rehabilitate approximately three miles of track from Radebaugh to South Greensburg by replacing jointed rail with continuous welded rail, that will improve the replacement of existing rail and steel components on the Radebaugh subdivision, $1.7 million.